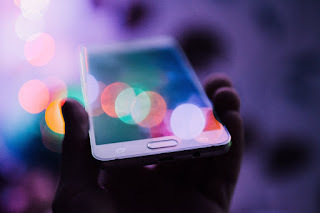 National Payments Corporation of India (NPCI)’s national electronic toll collection (NETC) program has gained significant momentum and now accounts for 25% value of the total toll collected. National Highway Authority of India (NHAI) & Indian Highways Management Company Limited (IHMCL) had engaged NPCI to create an interoperable, scalable solution to meet the electronic tolling requirements of the Indian market and accordingly NPCI had launched the NETC programme in December 2016. 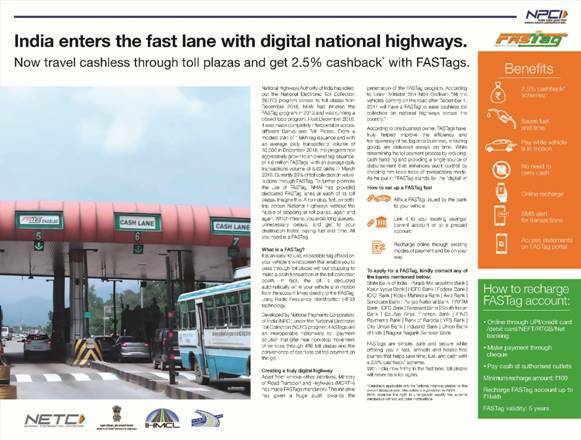 NETC encompasses a common set of processes, business rules and technical specifications which enable a customer to use a FASTag that is affixed on the windscreen of the vehicle as payment mode on any of the toll plazas irrespective of who has acquired the toll plaza. FASTag is a RFID passive tag which permits the customer to drive through toll plazas, without stopping for any toll payments. The toll fare is directly deducted from the linked account of the customer. FASTag is also vehicle specific and once it is affixed to a vehicle, it cannot be transferred to another vehicle. In order to promote the vision of One Nation – One Tag National Highway Authority of India (NHAI) and Indian Highways Management Company Limited (IHMCL) conducted a workshop on March 28 2019, to discuss and extend the FASTag services across all State & City toll plazas. IHMCL has come out with an attractive State/City/SPV onboarding policy, whereby they would be providing financial assistance to the State/City/SPV authority for implementation of NETC program. The workshop was attended by officials of Indian Highways Management Company Limited, National Highway Authority of India, National Payments Corporation of India, Karnataka State Highways Improvement Project (KSHIP), Gujarat State Road Development Corporation Limited, Maharashtra State Road Development Corporation, Madhya Pradesh State Road Development Corporation, Tamil Nadu Road Development Company Ltd and officials from NETC member Banks.